A brilliant movie, and a dangerous one. After watching JFK, it is difficult to believe that anything other than an elaborate conspiracy was responsible for the 1963 assassination of US President John F. Kennedy in Dallas. Director Oliver Stone weaves together a narrative that is fictional yet so compelling, incriminating the military-industrial complex, the mafia, the Cubans, the Dallas police and Mayor's office, all the way up to Vice President Lyndon Johnson, with alleged trigger man Lee Harvey Oswald (Gary Oldman) playing nothing but the patsy, as he always claimed. Only the President himself, it seems, was unaware that the President was about to be assassinated. And this is where Stone's case really crumbles like an elaborate castle built on air. His conspiracy theory ends up pointing the finger at hundreds of people, in a classic throw-all-the-mud-at-the-wall-and-see-what-sticks approach. Not only would such a plot be much more incredible than the lone gunman story, on closer examination, most of the case that Stone builds is based on half-truths that are stretched several degrees past reality. It takes some time, but it is worthwhile to go through the patient debunking of most of Stone's thesis, for example as presented on the website One Hundred Errors of Fact and Judgment in Oliver Stone's JFK. Only then does it become clear how dangerous a movie can be in influencing opinion by just slightly twisting or expanding every factoid. Setting that aside, JFK is marvelous entertainment. More than three hours zip by as Stone uses dazzling cinematic techniques, combining menacing documentary style back and white scenes with a vivid recreation of the entire assassination in Dealey Plaza, interspersed with the re-imagining of Oswald's story and that of the myriad of shady yet colourful characters implicated in the mind of the conspiracy theorists. 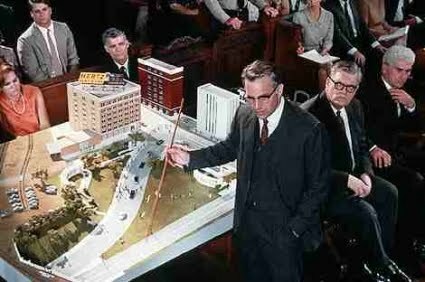 The focus of Stone's narrative is New Orleans District Attorney Jim Garrison (Kevin Costner). Three years after the assassination, Garrison opens an investigation into Oswald's activities in New Orleans. Garrison is quickly engrossed in the assassination case to the point of obsession, and gathers a team of investigators to track down all leads related to Oswald. As Garrison's family life starts to suffer and his wife (Sissy Spacek) is ignored, Oswald's acquaintances in and around New Orleans come to life through the investigation, including mysterious characters like bushy-eyebrowed David Ferrie (Joe Pesci), gay and rich Clay Shaw (Tommy Lee Jones), g-man Guy Banister (Edward Asner), sleazy lawyer Dean Andrews Jr. (John Candy) and the criminal Willie O'Keefe (Kevin Bacon). They are all presented as somehow related and working either openly or secretly for various government departments not happy with Kennedy's policies. Garrison is helped by a deep-throat type source presented only as X (Donald Sutherland), a Washington DC-based colonel in the US Air Force with his own strong doubts about the lone gunman theory. The performances from the star-sprinkled cast are excellent, with Costner doggedly determined as Garrison. The recognizable faces in every role add to the quality and entertainment value, and even the odd couple of Walter Matthau and Jack Lemmon have small roles, although never on-screen together. Garrison eventually hauls Shaw into court on charges of participating in the conspiracy to assassinate the President. Although there is very little evidence tying Shaw to anything, Garrison uses the courtroom as a megaphone to present an elaborate, grand conspiracy theory. Shaw is acquitted, and Garrison is humiliated, other than in the eyes of those who see conspiracy where incompetence is much more evident. The real conspiracy that needs to be investigated is how Stone managed to turn myths and half-truths into such a captivatingly terrific film.